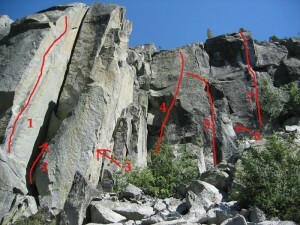 Technical stemming and thin face start gives way to easier climbing on big edges. From anchor, can toprope Flight Simulator. Can set toprope by walking to top or first climbing Changeling. FA: Todd Offenbacher, Chris McNamara, Brad Jackson, 7/03. Which SuperTopo guidebooks include a topo for Trust is a Must?